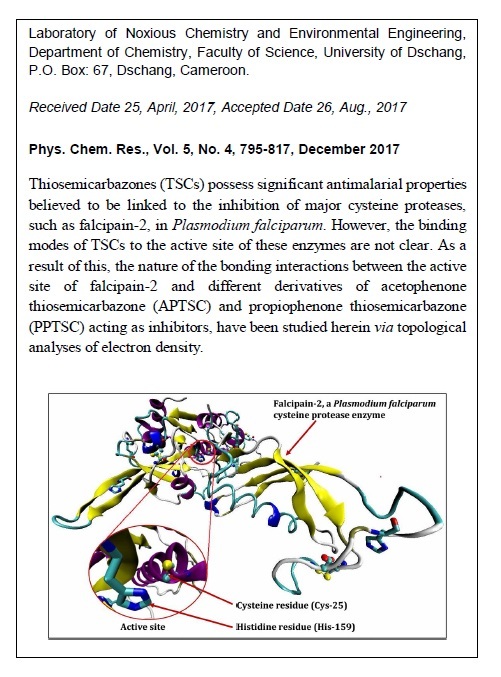 Thiosemicarbazones (TSCs) possess significant antimalarial properties believed to be linked to the inhibition of major cysteine proteases, such as falcipain-2, in Plasmodium falciparum. However, the binding modes of TSCs to the active site of these enzymes are not clear. As a result of this, the nature of the bonding interactions between the active site of falcipain-2 and different derivatives of acetophenone thiosemicarbazone (APTSC) and propiophenone thiosemicarbazone (PPTSC) acting as inhibitors, have been studied herein via topological analyses of electron density. Derivatives of APTSC and PPTSC are well known to possess inhibitory effects against Plasmodium falciparum. 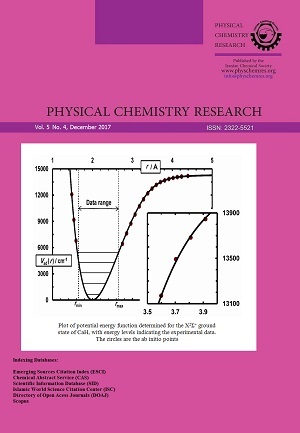 Equilibrium geometries of the inhibitor–active site complexes in the aqueous phase have been obtained via dispersion-corrected density functional theory (DFT-D3) calculations. In-depth analyses of the covalent and noncovalent interactions in these complexes have been performed using the quantum theory of atoms in molecules (QTAIM) and the noncovalent interaction (NCI) index. Results have revealed a covalent interaction between the thiocarbonyl carbon of the TSC moiety and the thiolate sulfur of the active site cysteine residue of falcipain-2. Moreover, hydrogen bonding, dispersive-like van der Waals and π-stacking interactions have been elucidated between the TSC moiety of each inhibitor and the histidine residue of the enzyme’s active site. The synergy of these interactions can enable the TSCs studied herein to specifically but transiently bind to the active site residues of falcipain-2. Based on our results, APTSC and PPTSC derivatives are potential reversible covalent inhibitors of falcipain-2, and are therefore promising precursors for the manufacture of antimalarial drugs.